(a) Turret Stop - It controls the exact length of the bar out of the chuck. All dimensions of the job are taken with the machined face of the bar as reference. It is of two types fixed type and adjustable type. Advantage of adjustable stop is that its setting can be altered without disturbing the main setting of turret head face. It is always fitted in one of the faces of turret head. (b) Centring Tool - It is used for making a centre hole in the exact centre of the job. Being very short and rigid its action will not be influenced by eccentricity. This tool may be provided with additional flat cutter for facing the end of the work at same time. It is supplied with a shank, which is pushed in the hole of turret head, other end of the tool caries a centre drill and three rollers. Upper roller may be set to bear lightly on the bar whilst the lower one is adjusted by the thumb nut to give required pressure. An alternative pattern of this tool employs one fined “VEE” instead of roller, for steadying and centralizing bar for drilling. (c) Drill Holder - Twist drills having Morse taper shanks are usually held in a socket, which is parallel (round) from outside and tapered from inside. These sockets are introduced in to the bracket of flange tool holder and clamped to turret by setscrews. Straight shank drills are mounted on a drill chuck. 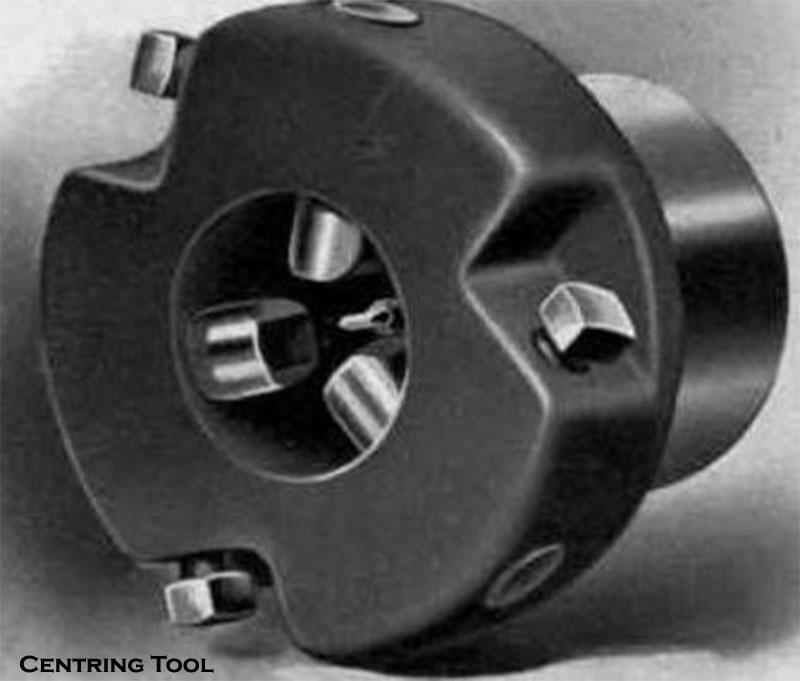 (i) Stub Boring Bar - The bar is short and has its cutter projecting from its one end. This type of bar has maximum rigidity and it can be used for heavy material removal. (ii) Pilot Boring Bar - Leading end of this boring bar is supported by a bushing at the spindle end and the holder at the other end. It is rigidly supported at both ends and hence heavier cut can be taken with accuracy. These bars will have a plain portion in the leading side so that they enter the bush. (e) Boring Bar Holder - This holder is also called extension holder or flange tool holder. These are used for holding boring bars. 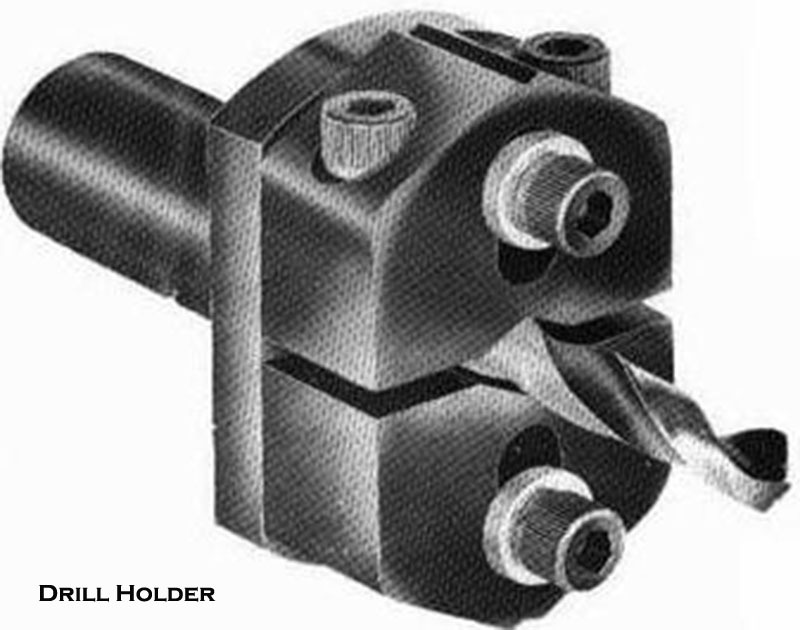 The flanged end of the holder is bolted directly to the face of the turret .The holder can also be used to extend the length of the shanked tools or bars by fitting in to the bore of the holder and then adjusting its length. 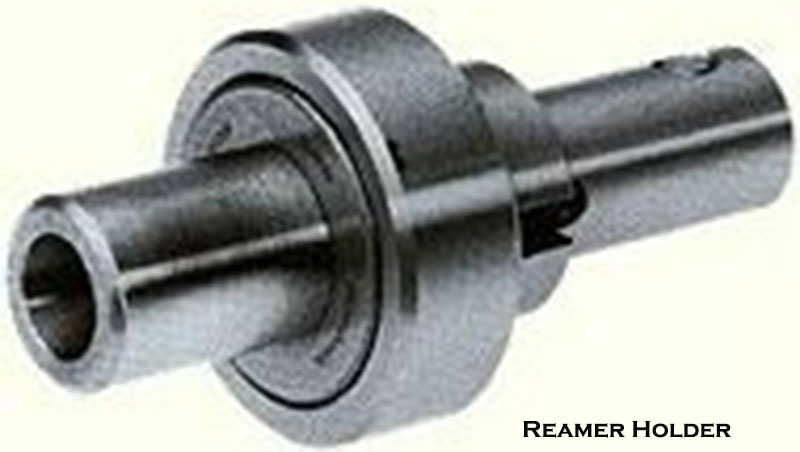 (f) Reamer Holder - The reamer provides a ready means of finishing and sizing a hole after drilling and boring. A short fluted machine type reamer is usually employed which may be solid or adjustable pattern. Standard practice of holding reamers in a capstan and turret lathe is in floating holder, which permits some amount of end movement of the reamer to align itself with the work. 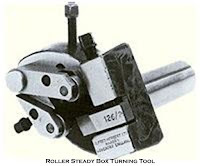 (g) Flat Steady Box Tool - It is a turning tool. In construction it incorporates two tool posts on T-slots. On the front end it has got a small tool post to accommodate the cutting tool and just opposite to the tool there is a “V” shaped support identical to “V” block which support the job against the tool pressure. The “V” shaped support and tool both can be adjusted to turn any required diameter up to the maximum capacity of the box tool and can be locked firmly in their respective places to ensure perfect rigidity. This arrangement helps the material to be removed in bulk in a very short time. Flat steady box turning tool is mainly used for soft material such as brass. (i) Poor surface finish produce at light cut. (ii) Continues chips may get entangled with the rollers and interfere with its working. (i) Multiple Turning Head - It is used on a work where a number of multiple cuts are taken in the same turret position. The tools are set at different position on the head by inserting the shank of the tool holders in different holes of the multiple head body. A boring bar is held at the central hole of the head which is aligned with the supporting axis of flange. (j) Multiple Tool Block - It is used on square turret in order to increase its range. 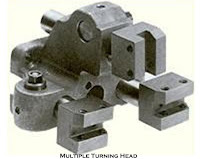 Standard multiple tool blocks can be bolted to any face of the square turret. The block allows the use of as many as four tools on any one of the faces of the turret. This permits the multiple tooling on production work. (k) Knee Turning Tool - It is useful for simultaneous turning and boring or turning and drilling operations. This incorporates a bracket which is attached to the face of the turret and embodies a plane surface in a vertical plane which is provided with “T” slots for clamping a tool holder bracket. The bracket can be adjusted vertically so as to enable the tool to machine various external diameters. 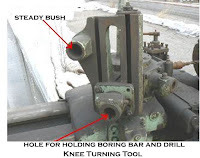 At the top of knee turning tool a bush is fixed, known as steady bush, which receives overhead piloting bar.